Solstice convert listed on the Barrett-Jackson auction to be sold on Tuesday, January 15, 2019. Very nice looking RED convertible. Listing says V8, but then says 4 for the number of cylinders. Attempts to attach a photo has not been successful, thus go to barrett-jackson.com and search for LOT #131. 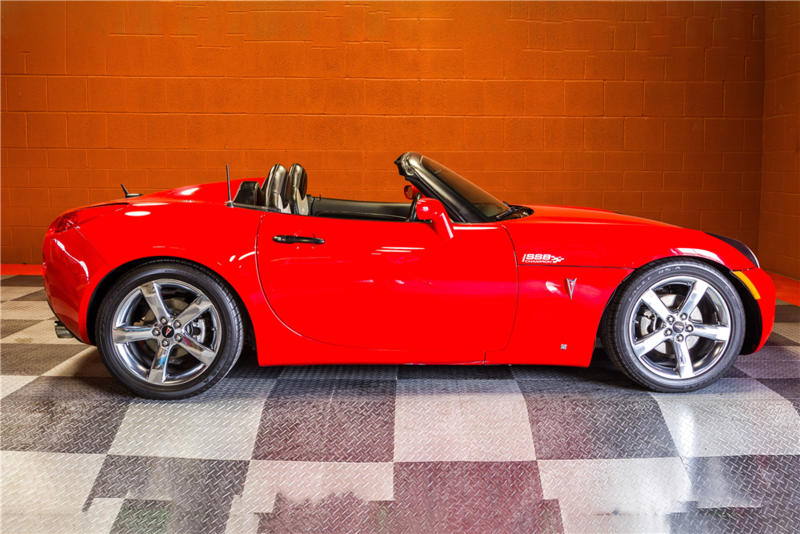 Lot #131 - This 2008 Pontiac Solstice convertible was built with the SCCA SSB package. 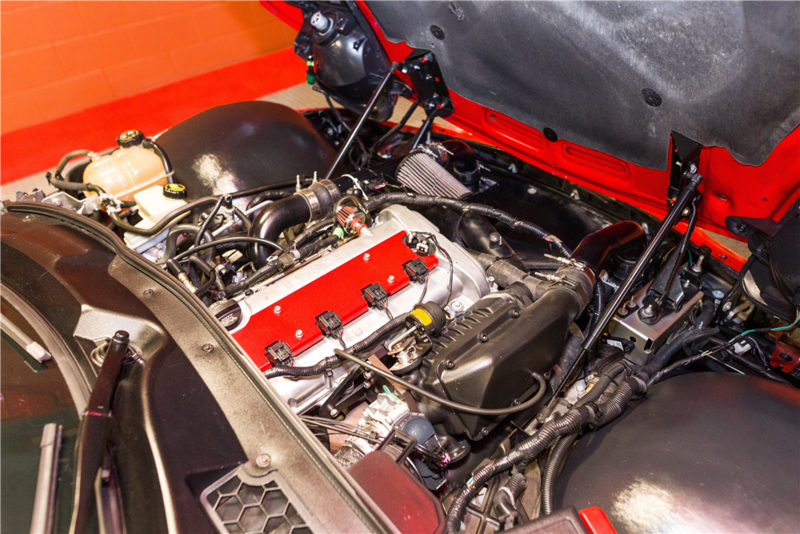 It is finished in red with a black SCCA SSB interior and has less than 51,000 actual miles. It is powered by a 2.4-liter 8-cylinder engine mated to a 5-speed manual transmission. The Solstice won the SSB and T2 classes of the SCCA Club Racing division at the 2007 Runoffs at Heartland Park Raceway in Topeka, KS. 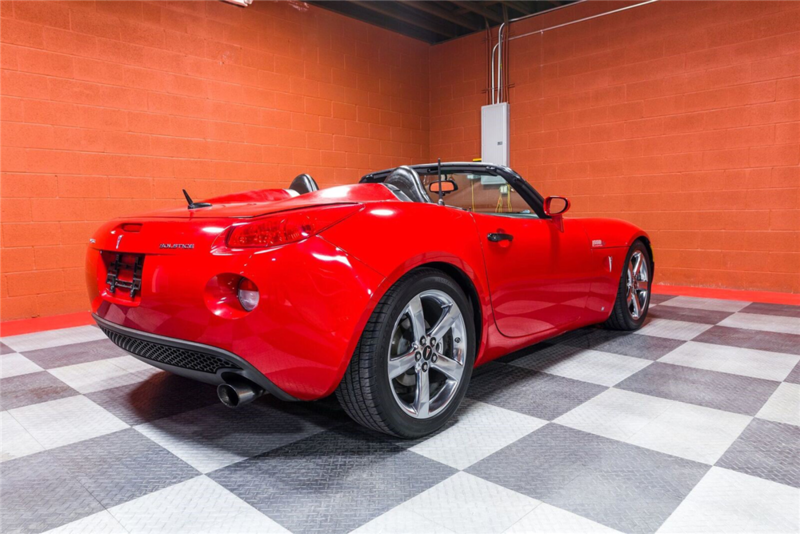 Because of this, Pontiac offered two limited production models: the SCCA SSB Champion Edition, which was available on base Solstice models, and the SCCA T2 Champion Edition, which was available on Solstice GXP models. Each carried unique graphics, stripes and embroidered light titanium leather seats along with higher levels of standard content. CARFAX shows General Motors manufacturer safety recall issued on 06/20/2017: My Pontiac Solstic Saturn Sky – Passenger Presence System (PPS). It's a 2.4 with what appears to be a supercharger kit on it . Sting ya, thanks for the heads up on the SC. I saw that in the engine view, but wasn't sure what it was. Thanks on that. If the bidding gets to the 12's, it will be an expensive car with the fees & taxes on top. At least it will be sold with the ability to title and drive it. 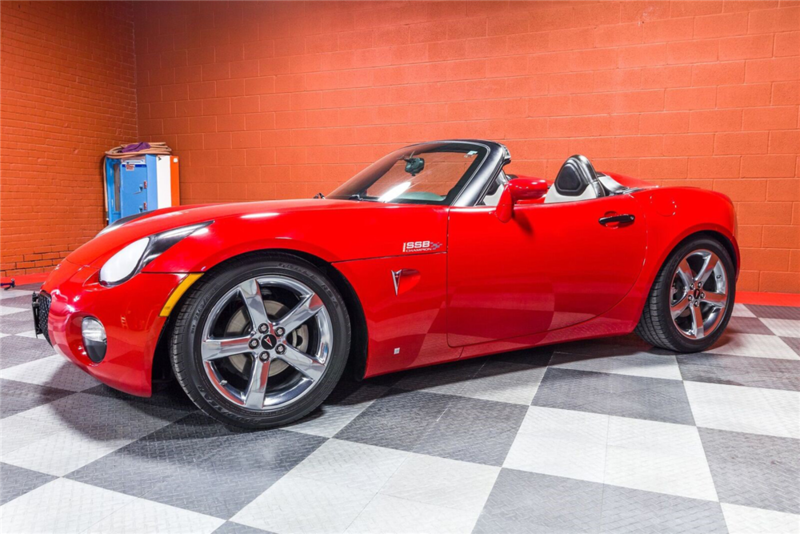 Last year, a Sols sold at B-J that could not even be titled and driven on public roads. ....... Last year, a Sols sold at B-J that could not even be titled and driven on public roads. I don't think you can put a movie prop (I assume you are referring to the Transformers-Jazz car) in the same class as a regular car. I would say that it very likely was not purchased to be driven, although that is certainly a possibility. 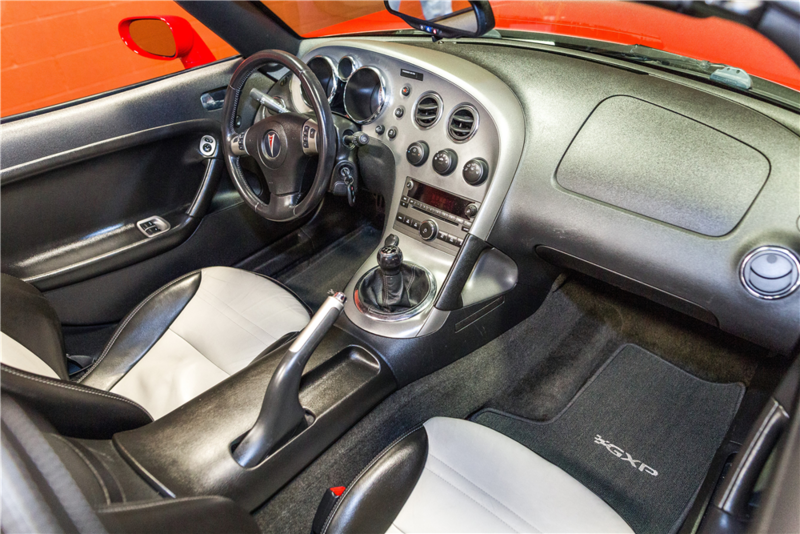 For your viewing pleasure, even has GXP floor mats. Wow! Otherwise, nothing much special about this one. EDIT: Oops, missed the DDMworks Magnussan Supercharger kit. Last edited by DaveOC; 01-03-2019 at 04:51 PM. Thanks, Dave. For some reason my attempts that time in the drag&drop effort didn't work. ???? There is a reason the drag N drop didn't work, so I always do it the old way via the "manage attachments" link. I also did another little twist to the BJ slideshow to get the full size images, which involved saving the images to my hard drive. I have never had a problem with drag-and-drop. What is the reason? The display on the Barrett-Jackson site has a rolling change that shows all five images one after another then repeats, and for some reason it interferes with the drag n drop feature here. I'll mess around with it just to verify. That's what it is, if you drag one of those rotating images to the drag and drop area, nothing happens. Right click that image and save it to your hard drive as a jpeg, and then you can drag and drop, from your hard drive, to your heart's content, and it'll work beautifully. Last edited by DaveOC; 01-03-2019 at 09:06 PM. I did save to my HD and attempted the D&D from the HD as normal. But, I'll bet you hit on the secret that I did NOT note the .jpg of the file type, thus would not work. I'm sure that is probably it. I'll try and remember that. Wait!! Just checked the HD and those saved photos were .jpg files. The file size was 1.6M each, so maybe that is it. I know they say there is a size limit, but I've never bothered watching smartphone file sizes and they always go up to Dropbox and then D&D to my posts. So I guess I'm still in a puzzle at this point. One more edit: There is a difference between a .jpg AND a .jpeg. Looking at Dave's list of file types, my saved files are not of an accepted file type. Must be the issue!! BUT, the list does go on to say .jpg, so I give UP!! Last edited by 44thSKY; 01-03-2019 at 09:57 PM. Now I get it. I thought you were saying that dragging and dropping a file wouldn't work. I would never have expected to be able to drag and drop an image from a web page. Thanks for the clarification. Barrett Jackson charges a 10% buyers fee on top of the 8 % sellers fee this is obviously based on the selling price there is also a registration fee to bid depending on the location of the auction and the taxes to be paid based on what state the car is going to after the auction . If the car remains in the state where the auction takes place BJ will take the appropriate taxes out . So let's say this car sells at auction for $ 12000.00 add in the $1200.00 buyers fee and the $200.00 registration fee (I'm using this as an example ) the car ends up costing the buyer $13600.00 plus taxes and transportation cots if the buyer is not local .At 8% sellers fee BJ ends up making roughly $2360.00 in fees on this sale . Last edited by Sting Ya; 01-05-2019 at 09:05 AM. Or, it just might have been a down day for the forum software, or the other possibility is that the forum is now using lower limits than is being shown, as we don't get much attention from the Administators and programmers. It's possible that they've dropped the limits and not adjusted what is shown. I just uploaded four pictures via drag-and-drop that ranged from 1.34 to 1.58 Mb, so the limits haven't dropped much, if at all.